Glenside Hospital Museum is inside this beautiful1881 chapel. Having interesting and memorable attractions to visit always adds excitement and wonder to a short break away. 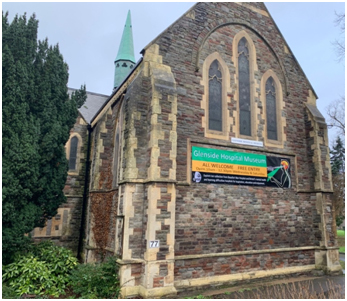 On your next trip to Bristol we highly recommend a visit to the Glenside Hospital Museum. Founded by Dr Donal Early who worked at Glenside Hospital as a consultant psychiatrist, this intriguing attraction gives visitors a deep insight the goings on at Glenside Hospital and the trials and tribulations of running a mental health hospital. Visitors can see the various collections and artefacts that were collected over the years. To find out more on the history of the hospital click here. What collections are available at GHM? There are three hospital collections: the physciatric hospital that began as a Victorian Asylum (1861=1994), Beaufort War Hospital when the asylum was taken over by the War Office and treated just under 30,000 wounded (1915-1919), and the Stoke Park Learning Disabilities hospitals (1909-2000). Visitors can find the exhibits in the 1881 Grade II listed hospital chapel. There is also an online shop where you have the chance to buy information on aspects of the hospitals history. Click here to view. The museum is open on a Wednesday & Saturday from 10am to 12.30pm. Other days are available by appointment. This is a unique attraction that should be part of your next short break in Bristol. See something different, visit the Glenside Hospital Museum in Stapleton, Bristol.